The recorded history of Springbrook, NY really begins after the year 1842. By 1849 approximately 50 families lived here and about 10-15 of those were Catholic. Thomas Flanagan gave to the Catholic Community land for a Cemetery. It was used as a burial ground while still planted with corn. As there was no church in town, Mass was said once a month in the Flannigan home. The mission priest ministering to Springbrook Catholics at this time was Fr. Thomas McAvoy of Java, NY. The property of our present parish, originally called St John’s was deeded from Thomas Flannigan to John Timon (first Bishop of the Buffalo Diocese). The first deed was dated February 23rd, 1850 and it is from this date that we start the history of St. Vincent de Paul Parish. 1853 Fr. J. Doran broke ground for the first church. The 20' x 30’ structure was extremely primitive; four posts and a frame enclosed with planks, large loose boards for a floor, a rough board altar, and no seats. 1857 Fr. James M. built the first rectory. 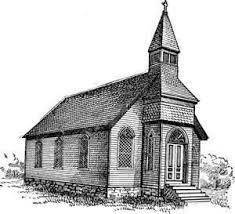 At this time a school was opened in the church to teach religion. 1865 Rt. Rev Bishop Timon administered the first Sacrament of Confirmation. 1874 The original church was moved to the east end of the property to be later used as a barn for the parsonage. A second church was built on site. However, after the frame was raised, high winds leveled it to the ground. It was raised again. This was the main portion of the ’old church ’ as we knew it. 1892 First Printed Financial Report - Total receipts from Springbrook, East Aurora, and Marilla were $974.28 (for eight months). 1900 The original church, then being used as a barn, was sold at auction for $20.00 and moved to Blossom Rd. south of the railroad. 1905 St Vincent’s School is started in the choir loft of the church. 1908 The Marilla Catholic Church was moved behind St. Vincent’s Church and used as our first school. The church was raised and a basement was added as well as an addition to altar area. 1910 The Sisters of St. Francis of Williamsville came to the parish and became teachers in the school. 1919 St Vincent’s once again formally becomes a parish rather than a mission church. 1926 Rectory built (now is Convent). 1988 New Church & Rectory built, old rectory becomes Convent. 1993 Father Jim Walter joined St. Vincent de Paul Parish. 1997 Old Convent moved across Seneca St.
1999 Old Church on the corner was taken down. 2001 Bell from old Church added to canopy of new Church.